If you are leaving Marmaris without enjoying its vibrant nightlife, you are missing a truly great experience! Graceful live performances are an integral part of most Turkish Nights. 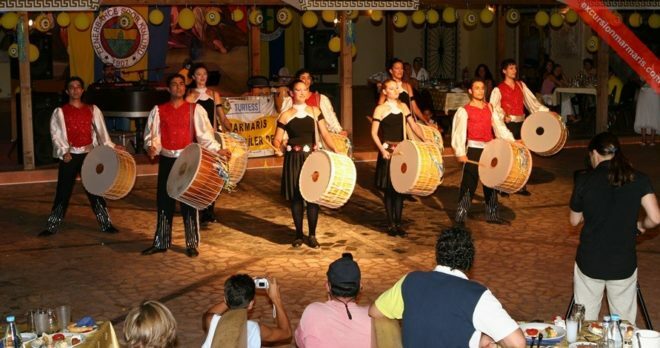 In Marmaris Turkish Night Show you can see artists playing music, dancing and the participants enjoying the evening festivities with great enthusiasm. Turkish belly-dancers, folklore musicians and dancers from Anatolia add more color and fervor to our show. Visitors can enjoy the entertainment as they are served with Turkish cuisines also unlimited alcoholic and non-alcoholic drinks during our show. 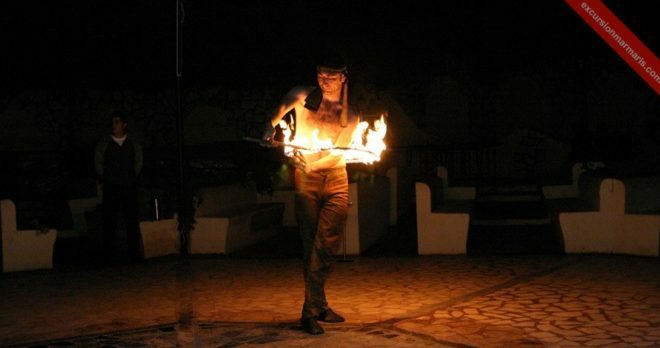 These eventful Turkish nights in Marmaris offer much more than you expect. Apart from rich food, drinks and live entertainment, frequent guest participations add more charm and enthusiasm to these nights. Guests can compete in belly dance competitions and get rewarded as well. The 4 hour Turkish night trips are arranged from Marmaris, Icmeler and Armutalan from May to October. These trips begin with picking you up from your hotel at about 19:30 pm. Unlimited Soft Drinks, Wine and Beer. The trip fee includes the pick-up and drop-back services, entertainment, dinner and local house wine. You will have to pay the expenses incurred on other drinks. 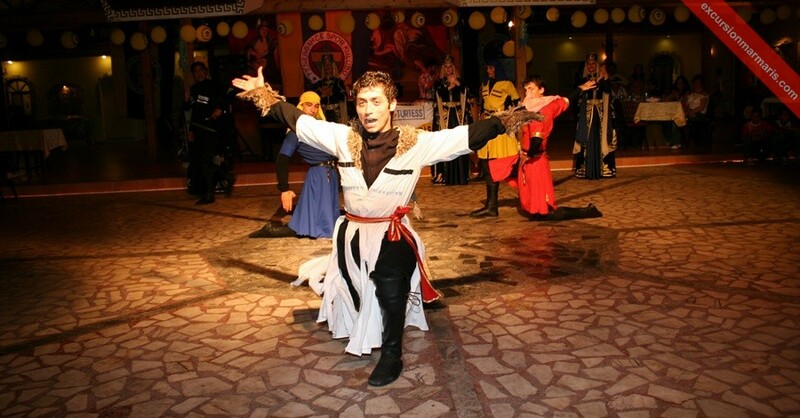 You arrive at Kervansaray about 20:00 pm, where live performances are about to begin. The show begins as the Turkish folk dancers enter the stage and give a beautiful dance presentation. 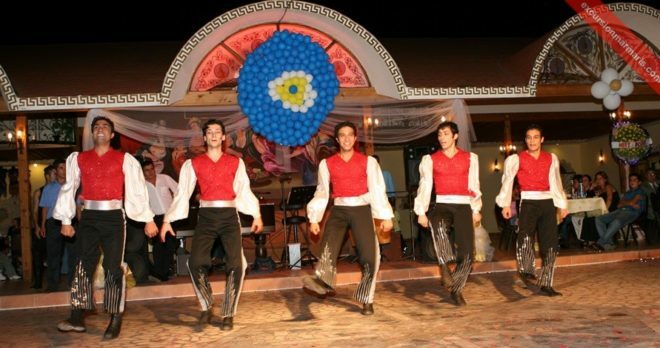 The waiters in the show serve you the main course made of chicken and rice, unlimited alcoholic and soft drinks and appetizers. The traditional dancers dressed as brides in beautiful red dress dance in the center of the stage. Grooms also dance and perform various feats to impress their brides. After this enactment, all the guests are invited to the stage and join them to dance. 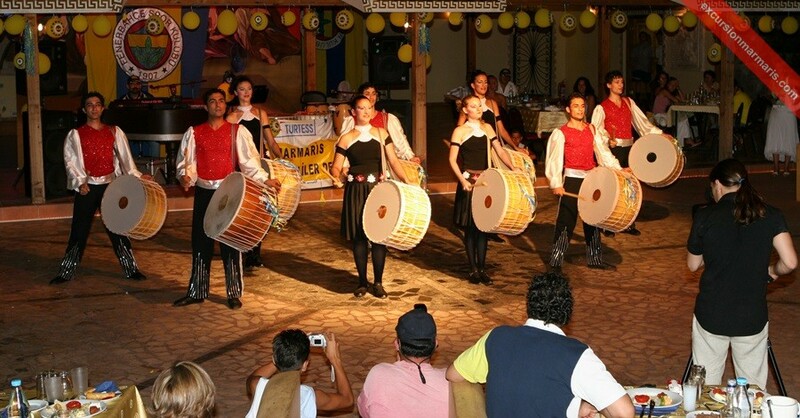 You can enjoy many such folk dance presentations during each night trip. After this, the belly-dancers arrive on the stage. They give a breathtaking performance and mesmerize everyone present there. They move about all the places in the restaurant and pick one man at a time to dance with her. It is very entertaining to watch how men try to learn the secrets of belly dancing from them. Following this, the party comes to an end after the fire dance and the drum show. You are taken back to your hotel at about midnight but we bet you will continue the show in your dreams and remember this exciting experience for long! 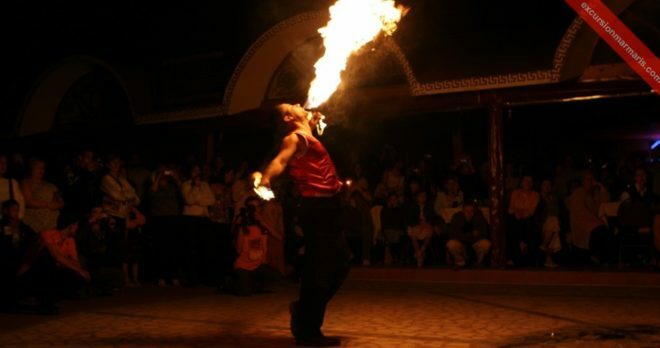 Marmaris Turkish Night Excursions is not only a great because of the food and drinks but the show that you will attend that night is really breath taking . 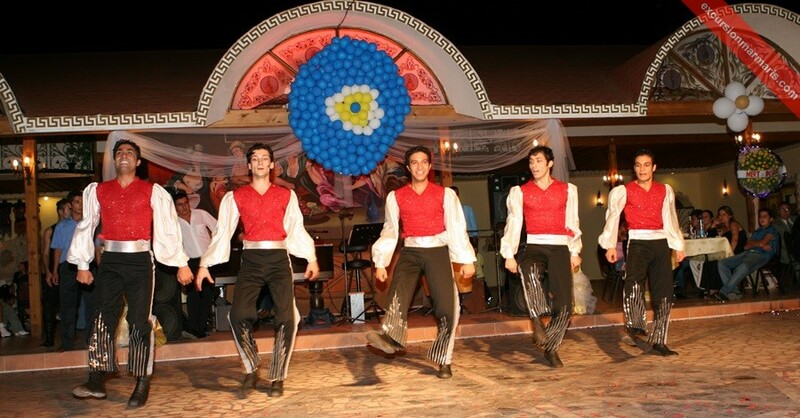 You will for sure enjoy all the folk dances from different regions of Turkey. You will have the chance to see a traditional wedding show as well. During Turkish Night you will be served a delicious dinner with starters ,main course , fruits , the price of tour also cover unlimited soft drinks , beer and wine . You can't imagine a Turkish Night with out belly dancers, there will couple of different belly dancers male but also female . 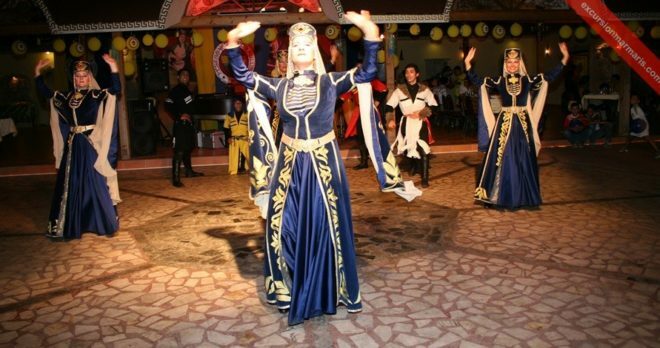 Turkish night can be the night to gain some skills of traditional Turkish Belly dancing. Absolutely a great night everybody in the group will enjoy the Turkish Night , its fun for every age group . There is always enough food , drinks for everybody. First of all, I would like to tell all people that I booked this tour for the show not for the food. But i must say that the food was good and drinks were enough for everybody. Kervansaray has standard food and drinks service for everyone. If you want to drink or eat anything else you can buy there. I have to tell that it was a very good night and Turkish people know how to make a party. From my point everything was very well organized and well. 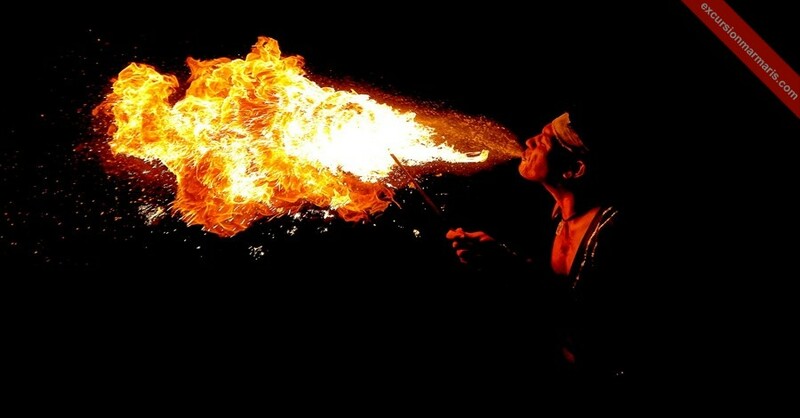 If you are around Marmaris, don’t miss this show. 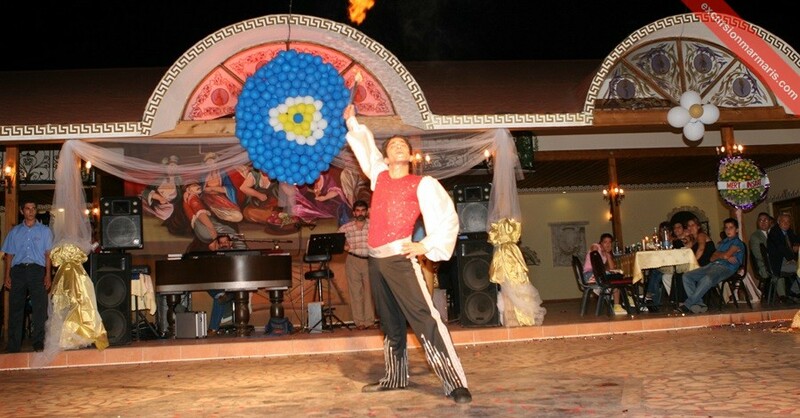 In Marmaris, if you are looking for a good turkish night show, then book with Mares Travel. It is a very good organization. All package covers transfer from the hotel and food with turkish night. Really enjoyed it. When i arrived to Kervensaray, i was not really sure what to expect. However minutes after the show started, it became very clear that i as to experince a very professional show. Turkish folk dances alongside with some very talented belly dancers. I couldn’t recommend Kervensaray’s Turkish Night Show more highly – you really won’t be disappointed. We booked thru this website online, they collected us from our hotel in their mini bus. We had a great night with wine, beer, food and entertainment included in the price but keep in mind that you have to pay for the other drinks. The show was ok, pretty entertaining including the male belly dancer who was very good but i must admit that it was bit weird. The food we had was a selection of different starters and gave the children a plate of chips. Main course was as usual chicken, rice, chips and salad. Ant they served us melon as desert. The whole organization was very much for the tourists and as a tourist i really enjoyed the Turkish night show in Kervansaray.